We are very excited to welcome Emma Congdon as one of our designers! Emma Congdon is a freelance graphic designer from London with more than one string to her bow! 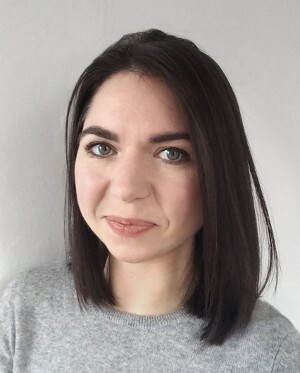 As a freelance designer Emma works with a variety of tasks, ranging from creating cross-stitch patterns to designing advertising campaigns for major global companies such as Colgate and Baileys. Emma's interest in handicrafts and embroidery was awakened by her grandparents, who taught her to sew and encouraged her to develop in needlework. With one foot in the tradition, Emma tries to develop and modernize the range of embroidery patterns with her designs. Just as for The Folklore Company, Emma's career in embroidery began with that she wanted something embroidered on the wall at home - but didn´t find anything that suited her style. She then took matters into their own hands and created her own pattern, which thanks to her artistic talent became an unexpected success. As Emma's interest in pattern design grew and more embroidery patterns were created, the attention and recognition from the outside world increased. In the end, it was impossible not to take the plunge and engage full time in graphic design, and since 2012 Emma has been freelancing from her base in London. Emma's style is fun, daring but with a nostalgic touch. With her modern cross stitch design, she has made cross stitch more accessible and even managed to attract the audience that is more interested in contemporary craft. Check out more of her designs on her website: www.emmacongdon.com. We hope you will like the cross stitch patterns she has designed for us! A beautiful and detailed cross-stitch pattern in spring colours with swallows and butterflies. The lovely colors of summer have inspired Emma to this beautiful and romantic embroidery pattern! A classic cross stitch pattern in blue and white, available in 5 different versions! A cross stitch pattern with spring flowers in pink and green - available in two different versions. A sweet pattern with hearts on line - available in two different versions.